-looking for packagers: RPM , DEB !!! 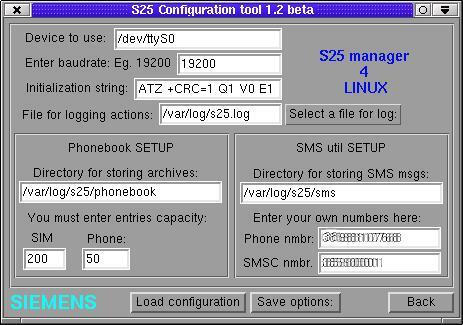 This project was started for my own needs, I got Siemens S25 Phone which is one of the best handy's I ever had, so I decided to wrote some simple utility to manage most of functions from Linux Box. First there was a couple of CLI tools written in Tcl , and they are now incorporated in S25-manager as a features. Most of my coding time was spent on encoding SMS PDU sequences and uploading of Binary data to phone. I love Tcl , but I got to admit , that Tcl is not prepared for all those puts/gets on serial device! 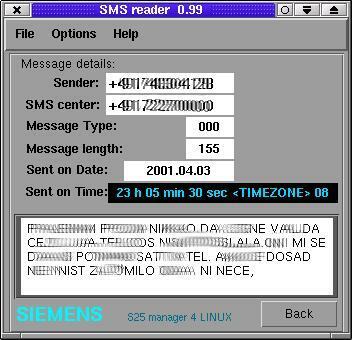 It is now a (almost) fully functional GUI application for managing most important functions of Siemens S25 phones. Please before you use this software , back-up all important SMS-messages and Phonebook entries, Author is NOT responsible for any damage (SIM-locked , Hardware failure) or loos of data on your phone! Program is released under GPL license. -Phonebook editing , archiving and restoring ( insert/delete entries ) selection of SIM/ME storage. Image show up a cute SMS-reader in action! OK, that's it now go to this links and download this program! I hope it will work for you just fine as it works for me:-) if NOT please report bugs to me! 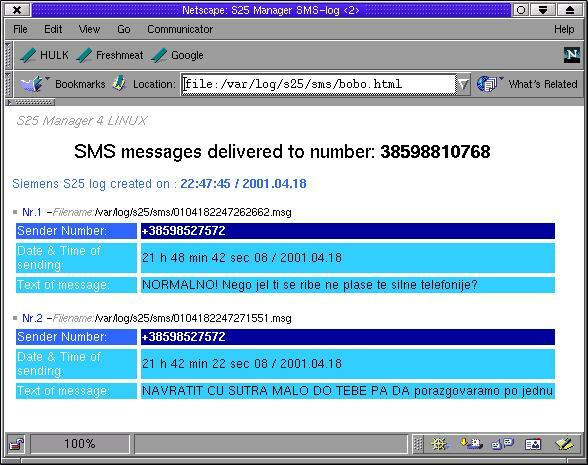 Finnaly I would like to recieve as many SMS- messages I can to help me develop a smart and reliable SMS-reader and sender! SIEMENS is a registered Trademark of "Siemens AG"